If you are interested in painting portraits or ­figures, working from “life” is essential. The nuances of light, reflections, and shadows on the form are de­fining & inspirational. 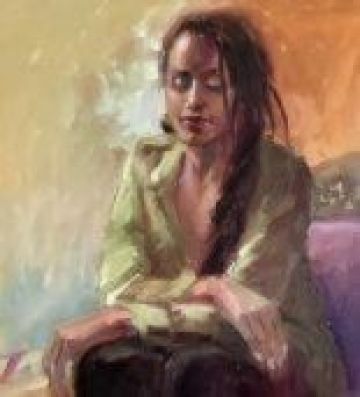 You will be painting from the model within a setting either outdoors or in the classroom, and you'll receive individualized instruction in composition, color, proportions, and the use of your medium of choice. Beginner and advanced students are welcome. It is important for the artist to not only know proportions, color and composition, but also his or her own style. This will come to fruition in time, and I believe that each student/artist should be encouraged in the development of that style according to ones own creative intuition. This class is ongoing “every Thursday” unless noted otherwise. Registration fees: Members $185; Non-members $215; plus model fee not to exceed $40. Model fee will be paid directly to instructor on the first day of class. Registration fees payable to MarinMOCA. If you would like to register for The Portrait and the Figure please complete the form below. Complete your enrollment by clicking the Buy Now button to enter your secure payment. Cancellation Policy: Fees are due at time of registration. You may cancel up to one (1) week prior to start of class/workshop and the fee, less $25 for processing, will be refunded to you. Should MarinMOCA cancel a class/workshop, you will receive a full refund. Should you cancel less than one (1) week prior to a class or workshop begins, you will not receive a refund of any portion of your registration fee. There are no refunds for individual classes that are missed within a monthly series. The Museum is closed from December 25 through January 1, July 4th, and Thanksgiving.